Every website owner is concerned about whether or not their company website is actually working for their business. At the same time, I don’t think enough website owners are aware of their website conversion numbers. If you are spending money on sending traffic to your website, either with paid advertising or paying someone to do social media marketing it is essential to track and measure results. If your website cannot convert the traffic to sales or leads, then you are wasting your money. There is no other maintenance activity that has a better return-on-investment than working on improving your website’s ability to covert visitors. Obviously more leads off your website has a direct impact on your business, so what’s your excuse for not making improved conversion your highest priority? When visiting a webpage for the first time, a visitor will spend less than 10 seconds reading that the page. The key to a good Conversion Activity is giving the visitor something to do quickly and making that activity easy to find on your webpage. How Do I Choose a Conversion Activity? What action could a visitor to your website take that would grow your business? Do you need a sale on the website? Do you need a hot lead? Or do you just need an email address so you can start a conversation? All of these are good visitor conversion options. You will need to decide what makes the most sense for your business and then make sure the Conversion Activity is prominent on all of your web pages. The visitor will use the form page to send you their information. When the visitor sends or submits the form, they are shown a “Thank You”. Tracking how many people see the Thank You will help us measure how many people complete your form. To make this work, the Thank You cannot be accessed from anywhere else on the site other than completing your conversion task. You will want to block your Thank You page from search engines and keep it out of the navigation and site map. Visitors should be redirected to a brand new page, and not see a pop-up box or a message on the form page, in order to accurately track conversions. Run some tests on your conversion activity and make sure a “Thank You” page has been set-up. If this is not happening already, spend some resources to get this set-up properly. Caution – be very picky about the goals you add. You are only allowed 5 sets of goals, with 5 goals in each set. AND once you add a goal, you can’t delete it. So you can’t remove old goals later to free up the space. Before you jump on Google Analytics, make sure you have a plan. To find your Conversion Rate, you need to know the number of visitors to your website in 2017 and the number of people who completed your Conversion Activity (ex. signed up for a consult on the website). This may take some leg work. Your best resource will be Google Analytics. Use the Acquisition reports to view just traffic from 2017. If for some crazy reason you don’t have Google Analytics, hopefully you were using another vendor that is providing you website statistics. Can’t find either? Try contacting your web hosting provider, or logging into your web hosting control panel. They should have a log report you can look at. Next you need to find the number of visitors who completed your Conversion Activity from the website. This will be easy if you already had Goals setup in Google Analytics. If not, this will require a little leg work. For an e-commerce store, all you need to do is count the number of sales you made last year. Otherwise, you are looking for examples of things like the number of emails you received from the website or the number of people who registered online for your events or the number of email addresses you collected last year in your newsletter signup. If you do have Google Analytics, trying looking at the Behavior Reports. See if you can find how many visits you got to your Thank You page and that should give you a rough number for how many people requested something from your website. You want this number to be higher than 2.5%. If it is not, then working on Conversion Rate needs to be part of your 2018 Website Strategic Plan. Solving this problem is not easy and might require some outside help. The key is to get this in your plan now, so you can budget for time and resources to solve the problem. Improving Conversions Part of your 2018 Website Plan? Download our Free 2019 Website Strategic Plan. 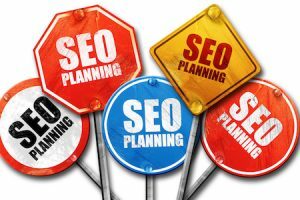 Section 4 our Website Strategic Plan will help with planning your Conversion Optimization process. In addition to the free download, you will receive a series of 5 follow-up emails to help with your plan.